Most Ahmadis today somehow believe that Allah has abolished the Divine Scheme of sending Mujaddidin in every century to revive the Muslims and to renew their Faith. They consider that sincere believers have to be content with the man-elected Khulafa in the Ahmadiyya Community for all practical purposes and that for the purpose of Divine guidance in future, if any, only an Ahmadiyya can elevated with Divine revelations by Allah (twa). The Divine Prerogative of choosing and selection whoever He wills has come tom an end with the establishment of Ahmadiyya Khilafat- at least, that is what the leaders and the priests within would like common Ahmadis to believe as religious doctirne. “It must be clear to you that when a true seeker lives Islam obediently and completely and each of his faculty truly and automatically follows God’s commands then the overall results of his efforts is that Allah sends signs of guidance to him on a larger scale without any intermediary veils. That is to say that this person will directly experience Allah on a higher level. Many kinds of blessings fall on this person. These commands were accepted due to his faith and because it was obligatory on him. During the time of the Promised Massih (as), the solar and lunar eclipses were observed from Qadian in 1894. Hadhrat Ahmad (as) stated that the eclipses represented heavenly signs in favour of him. He famously asked the people to ponder over the fact that the sign was manifested in his country and that the wisdom of God does not separate the sign from the person for whom the sign is meant. ”Allah has sent this humble self with lots of heavenly signs and the most flagrant and being a prophecy of both the Holy Qur’an and the Holy Prophet Muhammad (sa) is the eclipse of both the moon and the sun in the same month of Ramadhan back in November 2003 (November 9 and 23). At that time (in the Jamaat Ahmadiyya Al Mouslemeen), Allah made me stood up and proclaim that I was the one whose advent is announced through this heavenly sign in our present era, that this sign is for the advent of this humble self. Moreover, during the course of the Divine Manifestation (in its beginning), there were the rare (and frequent at that time) manifestation in the Mauritian Sky of sun-halos or what is also known as full-circle rainbows (October 2002 +, December 2007 etc.). Later on, in 2004 (June 8), scientists from all round the world took Mauritius as a vital centre for the observation of the extremely rare “Once in a lifetime” Venus Transit. It must be noted also that more than once, the name of Allah has appeared in the Mauritian Sky, and witnessed personally by this humble self along with a group from among my disciples. In addition, twice there has been the witness of the crescent of the moon along with its star (an Islamic symbol), where six months back on 11 September 2010, there have been once again this manifestation in the sky (after Maghrib and Esha prayers), to which I am a personal witness. Likewise, all round the world there have been manifestation of such like phenomena, so that they act as an eye-opener that all these rare occurrences in this special era (2000-till now – in my times). And now, I am going to prophecy yet another heavenly phenomenon, which is the splitting of the moon into two. Such phenomenon has happened in the times of the Holy Prophet Muhammad (saws) and in my times also, such sign shall be witnessed by my friends and foes alike as a proof of my truthfulness as the Chosen Messenger of Allah of this era, the second Muhammad (saws) whose advent has been prophesised in the Holy Qur’an in Chapter 62. This prophecy (moon-splitting) shall be physical and spiritual, both literal and metaphorical”. (Friday Sermon of March 25, 2011). Ahmadi scholars usually quote a prophecy of the Holy Prophet Muhammad (sa) regarding Khilafat in support of the permanent nature of the elected Khilafat in the Ahmadiyya Community . "Prophethood shall remain among you as long as Allah shall will. He will bring about its end and follow it with Khilafat on the precepts of prophethood for as long as He shall will and then bring about its end. A tyrannical monarchy will then follow and will remain as long as Allah shall will and then come to an end. There will follow thereafter monarchial despotism to last as long as Allah shall will and come to an end upon His decree. There will then emerge Khilafat on precept of Prophethood. 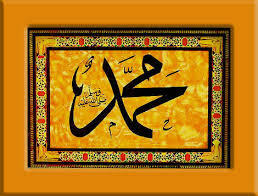 The Holy Prophet said no more”. (Mishkat). The argument is that “ Khilafat on precept of Prophethood” shall remain continued after the advent of Imam Mahdi till the Last Days. They point out that “t he Holy Prophet said no more” is an indication that “ Khilafat on precept of Prophethood” shall remain uninterrupted . In other words, the silence of the Holy Prophet Muhammad (sa) has profound meaning: there is nothing more to be said on the subject. One can only admire the spirituality of those who value not only the express words of the Holy Master (sa), but also the profound meaning of his silences at times. But the important question here is this: Can his silence be interpreted against his express words in other times or even against the context in which he remained silent? The Fourth Khalifa Hadhrat Mirza Thahir Ahmad Sahib is on record stating that in this tradition , Mujaddidin are included in the Khilafat that existed before the advent of Imam Mahdi. But, he also claimed that no Mujaddidin are mentioned afterwards in this noble tradition. As it happens, the Prophetic tradition uses the same phrase “ Khilafat on precept of Prophethood” ( khilafathun ala minhajunnubuvva ) both before and after the advent of Imam Mahdi. So, the argument that Khilafat in the past included Mujaddidin but cannot include them after the advent of Imam Mahdi do not hold water when examined against the express words of this noble tradition. It is ironical that the silence of the Holy Prophet (sa) in the tradition is being sought to be misinterpreted only to denigrate his other prophecy regarding the coming of Mujaddidin in every century. These arguments will only be rubbished for what it is by those who fear Allah alone: a desperate attempt to perpetuate an elected, family Khilafat system within the Community even at the cost of denying God’s Messengers. “God will continue to raise among these people, in the beginning of each century, a man who would teach them the spirit of Islam and thus, in a manner, renew the days of the Prophet”. To secure the future of Islam in its pristine spiritual purity, the community of believers was thus given the glad tiding of a wonderful arrangement- Khulafa of Allah being raised in every century to renew the Faith and to rejuvenate the garden of Islam. The objective was to preserve the letter and spirit of the Holy Qur’an for all times and for ensuring the development of high spiritual qualities among the believers in every century. 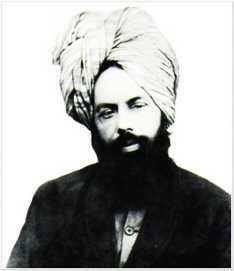 The Promised Massih Hadhrat Mirza Ghulam Ahmad (as) of Qadian explained that the achievement of salvation for everyone necessitated the coming of a Mujaddid (Khalifatullah) in every century. The Beneficent Lord has made “the arrangement in every century so that His creatures should not fail in any age to attain the stage of absolute certainty”. Hadhrat Ahmad (as) believed in the authenticity of this tradition of the Holy Prophet (sa). He projected it in support of his famous claim as the Mujaddid of the Fourteenth Century. On every opportunity that became available to explain the importance of the tradition regarding the coming of divinely ordained Mujaddidin at the turn of a Century, the Promised Massih (as) urged his followers to be careful against complacency on the matter. He cautioned that any one who raises objections against this noble tradition objects to the wisdom of the Holy Prophet Muhammad (sa). Further, he stated that rejecting this tradition amounts to denial of a Divine Plan of Allah, the Most High. 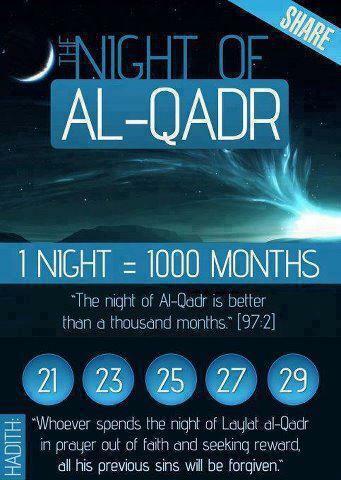 “The principal quality of Islam is that its blessings always accompany it. It does not speak only of the past but offers present blessings as well. The world is always in need of blessings and heavenly signs. It is not as if it needed them in the past and does not need them now". [A’ina-e-Kamalat-e-Islam , Ruhani Khazain , Vol.5, pp.245 ] . 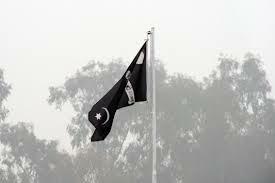 As per the Divine Plan and prophecies vouchsafed to the Holy Prophet Muhammad (sa), Allah, the Most High raised Hadhrat Mirza Ghulam Ahmad (as) of Qadian in the Fourteenth century of Islamic Calendar as Al Imam Al Mahdi to raise the flag of true spirituality. After his death, the Ahmadiyya Muslim Community that he founded, successfully carried the message of true spirituality and took it to the corners of the earth. According to the Holy Qur'an, the prevalence of injustice within a system will inexorably lead it astray from the way of Allah (38:27). The Fifth Khalifa Hadhrat Mirza Masroor Ahmad Sahib certainly believes that a wrong decision can be taken by a Khalifa on the basis of “a miscalculation or misunderstanding on the part of a Khalifa”. Hadhrat Musleh Maoud (ra) believed that ‘sometimes their advisors can give them wrong advice’. [Mirza Masroor Ahmad, Conditions of Bai’at and the Responsibilities of an Ahmadi, pp.202-203, (Islamabad, UK: 2006)]. He also warned the community that ‘if ever Khilafath comes under a shadow, it shall be because of the people around the Khalifa’. When Hadhrat Munir Ahmad Azim Sahib of Mauritius claimed that he is a recipient of revelations, the then National Amir of the Jamaat in Mauritius wrote a false report saying that the former does not believe in the Khilafat system. The only crime he committed was that he said he is a recipient of divine revelations. The Fourth Khalifa Hadhrat Mirza Thahir Ahmad Sahib, in a moment of unbelievable hubris, arbitrarily ordered him out of the Jamaat, basing himself on the report of his Amir, without asking any explanation or even looking at the revelations. Was that not an unfair and unjust decision? “Everything declines when reaching its climax. When the sun rises, then after some time it sets. Do not think that this means Qayamat, the Last day; but the greatest Qayamat is when a Chief of a Jamaat establishes injustice among the members. He will speak out arrogantly and show his superiority, his power of control, he will humiliate people and make them afraid of him and make them to suffer, threatening them of blowing them out of the Jamaat. This shows the decline of a Jamaat, the Qayamat. At this particular time, their true faces will be unveiled. They will torture the true believers’. ‘Refer to the Holy Qur’an, where Allah ordained Hadhrat Da’oud (as): ‘O David, We have made you a Khalifa in the earth; so judge between men with justice, and follow not vain desire, lest it should lead you astray from the way of Allah. Surely those who go astray from the way of Allah will have a severe punishment, because they forgot the day of reckoning”. (38:27). ‘This means: Do not stain the mirror of your heart with rust, passions. Otherwise you will deprive yourself from receiving the light of guidance. Allah will never manifest Himself in this kind of heart’. (Friday Sermon of May 30, 2008). The mainstream Ahmadi Muslims today do not consider that their Khalifa can be wrong on any matter because they believe he is divinely appointed. This is in spite of the clear statement of ‘if I do wrong, set me right’ by none other than Hazrath Abu Baker Siddique (ra), whose example was recommended by Hadhrat Ahmad (as) himself as the model for the Community to emulate. Knowingly or unknowingly, the Ahmadi Muslims have elevated a human being way beyond his official title and responsibilities and almost consider him to be the shadow of Allah on Earth, even though he has never claimed in the last many years of his office that he is even a recipient of divine revelations. In other words, the rank and file of the community is now virtually deifying their Khalifa. 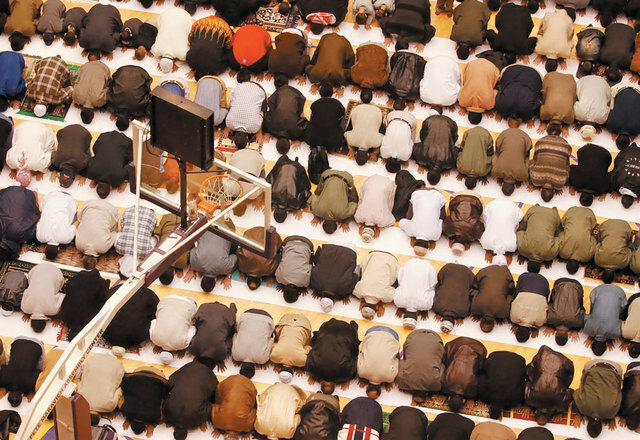 They are following an unexamined doctrine that is bound to corrupt their faith in Allah and His religion. Further, Ahmadis today generally find it difficult to accept the argument in favour of the emergence of a divinely appointed person in the presence of a Khalifa of the Promised Massih (as). They feel that they could accept the claim of a divinely appointed person only if their Khalifa agrees to the emergence of this divine manifestation. In short, they consider that any new Messenger of Allah could be recognized by them to be of such status only when their Khalifa agrees thereto. This is in spite of the fact that the Holy Qur’an reserves the honor of Khalifa of Allah only to Prophets and Messengers who are the Elects of Allah, and not to humanly elected Khalifas. The Holy Qur’an asks: “Can a blind man and one who sees be alike? Will you not then reflect?”(6:51). When the Khalifa himself is not a recipient of divine revelations, how will he be able to guide the community on the matter? And more importantly, can someone ever claim immunity from divine punishment for the denial of a Messenger of Allah on the basis of the opinion of their leaders and scholars? Even though people may not generally realize this, is it anything less than Shirk? What else is the meaning of Allah warning the people “fear not men but fear Me and barter not My Signs for a paltry price” when the series of “godly people and those learned in the Law” preside over them (5:45)? It is pertinent to note that Allah’s curse fell on other peoples because: “They have taken their godly people and those learned in the Law for lords besides Allah” (9: 31). The Jamaat of the Promised Massih (as) is at crossroads of spiritual history. Allah has sent a Mujaddid in the new Century as per the glad tidings foretold to the Holy Prophet of Islam (sa) and to the Promised Massih (as) himself. Will the Apostle of the Promised Massih recognize and accept and help the new Messenger of Allah as is required to, of every believer in the time of a Messenger of Allah? The new Messenger of Allah has been inviting the Ahmadiyya Khalifa to consider the facts in the light of the Divine scheme, right from the very beginning. And he is refraining from predictions on Ahmadiyya Khalifa precisely because Ahmadiyya Khalifa is on a self-imposed silence on the matter. Even when he visited Mauritius in 2005, the fifth Khalifa did not utter a single word on the issue. Now, can someone really think that he is unaware of the developments? And that the kind of persecution the Massih and his disciples are facing in Mauritius is not known to the Khalifa? Because of the opaque nature of the system, we will never come to know the real facts unless the Khalifa himself speaks about it. Contrary to these instructions of the Holy Book and the teachings of Hadhrat Ahmad (as), the Ahmadi Maulanas are spreading the belief that their Khalifa is above the rank of a Mujaddid and that the Khalifa has replaced Mujaddidin forever and there is no need for a Mujaddid anymore. It is very surprising that a “divinely appointed” Khalifa is shying away from displaying the special Divine support he is said to be enjoying. I cannot even begin to imagine that a divinely appointed Khalifa will keep his wisdom to himself on an issue of such profound significance. After all, is it not the duty of the Khalifa of the Promised Massih (as) to “preserve the Book of Allah” (5:45) and to clarify what it entails? The Islamic Khilafat of the past began with Hadhrat Abu Baker Siddique (ra) and continued during the time of the other rightly guided Khulafa, Hadhrat Omar Ibn Khattab (ra), Hadhrat Usman (ra) and Hadhrat Ali (ra). These devout companions of the Holy Prophet (sa) were intensely conscious about their material and spiritual mandates as the head of the Muslim community when they were thrust with the mantle of leadership. And also the inherent limitations attached to their specific situation as leaders because of the lack of divine revelations in guiding the community at a time when an Elect of Allah was not among them. Devout Ahmadis consider that the Ahmadiyya Khilafat is established in the best tradition of the Islamic Khilafat of the early days. Yet, the Ahmadis today are guilty of blurring the subtle and profound distinction that separates the true spiritual and material condition between a Divine servant in communion with Allah (swa), and the actual leaders they elect as Khulafa. For instance, most Ahmadis assume and believe without any shred of evidence that the present Khalifatul Massih Mirza Masroor Ahmad Sahib is a recipient of Divine revelations and that there can never arise anyone with Divine revelations so long as they have the Khulafa elected by the community of people. - (Malfuzat , vol.10, p.250). The Ahmadiyya Muslim Community in Kerala and elsewhere has come a long way from the days of persecution and struggle of the distant past. More than a century of existence has resulted in creeping materialism and decline of spiritual values within the Community. This is in spite of the presence of an elected spiritual leadership in the form of a Khalifa of the deceased Massih. No wonder, Allah has now revealed His time-testified Divine scheme by sending a new Mujaddid of the century in the person of Hadhrat Munir Ahmad Azim Sahib of Mauritius. When a Khalifa in the person of Hadhrat Adam (as) was sent by Allah, the angels showed their obedience and only Satan, the accursed “refused and acted with arrogance” (2:31-35). Likewise, whenever a Messenger of Allah appears in the world, only a few lucky souls will display their angelic nature and enlist themselves to follow the new Messenger and help the cause of Allah. On the other hand, inebriated with devilish instincts, most people of the time will usually reject the Message of Allah. When Hadhrat Ahmad (as) appeared at the turn of the 14th century as the Khalifa of Allah and Mujaddid of the Era, he was vehemently opposed by the people. Reflecting on this phenomenon of opposition, he observed: “Whenever a Servant of God appeared at the turn of every century as a Reformer, the ignorant people vehemently opposed him and strongly detested any attempt to correct the errors which had become a part of their habit and custom”. (Lecture Sialkot, p.10). People thus become habituated to their old ways and refuse to consider the claims of the new Messenger in the light of spiritual requirements of the age. They accuse the Messenger and his disciples of drifting away, and deviating from, the old path and creating a new faith. The members of the Jamaat of the Promised Massih (as) witnessed all these kinds of persecutions in their own life when they initially joined the Jamaat. They were accused of not having real faith in the spiritual message of Islam and the Holy Prophet Muhammad (sa) and of creating new divisions within the wider Muslim community and of forming a new religion. In every day life of ordinary believers, the trials took different forms and manifestations. Husbands were forcibly separated from their wives and children because they joined the new Jamaat, following the call of their heart and spiritual conscience. Even the judicial institutions of the country witnessed and testified to the struggles mounted by the new disciples in the pursuit of their human dignity and basic rights in the face of such deprivation of conjugal rights by the ignorant masses and their brain-less leaders. The Holy Qur’an records many such incidents in the ebb and flow of history and from the life of Prophets, including the life of the Holy Prophet Muhammad (sa). The arrogant lot who contemptuously reject the Message will invariably seek to harm and hurt and persecute the followers of the new Messenger. Inevitably, the disciples of Prophets have to endure great hardships and life-altering trials at the hands of their senseless opponents. Allah’s eventual treatment of such arrogance and hubris is also a well known lesson in history: the arrogant shall bite the dust and the Messenger and his disciples shall prevail over the world with help and succor of Allah. 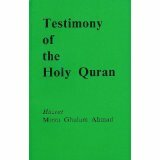 According to the Holy Qur’an, only a person appointed by Allah Himself and enjoys His converse on a sustained basis and receiving revelations from the Holy Throne can be considered a Khalifatullah or the Caliph of Allah. With regard to Hadhrat Adam (as), the Holy Book states: “I am going to place My Khalifah in the earth”. [2:31]. Like wise, with regard to Hadhrat David (as), the Holy Book states: ‘O David, We have made you a Khalifah in the earth’ [38:27]. And in both cases, it is patently obvious that the servants of God being addressed invariably enjoyed Divine converse and were appointed by Allah Himself as His Messengers or Khulafa. Apart from the two Messengers of Allah who were described as the Khalifah of Allah, the Holy Qur’an also speaks about another type of Khalifas. It refers to the subordinate Prophets who are Khalifas of another and a greater prophet such as the Israelite Prophets who all were the Khalifas of Moses. 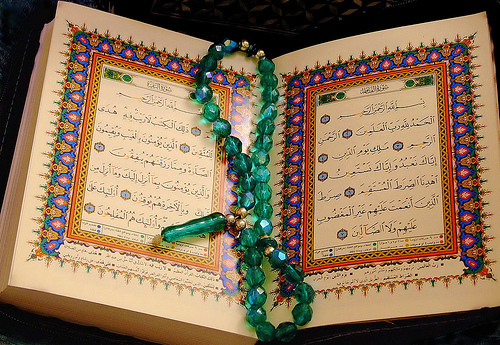 The Holy Qur’an states: “Allah has promised to those among you who believe and do good works that He will, surely, make them SUCCESSORS in the earth, as He made Successors from among those who were before them; and that He will, surely establish for them their religion which He has chosen for them; and exchange security and peace after their fear; They will worship Me, and they will not associate anything with Me. Then whoso disbelieves after that, they will be the rebellious”. (24:56). According to Hadhrat Ahmad (as), the phrase ‘as He made Successors from among those who were before them’ is a clear reference to the Khalifas of Moses who were all Prophets. When a Khalifa in the person of Hadhrat Adam (as) was sent by Allah, even the angels showed their obedience and only Satan, the accursed “refused and acted with arrogance” (2:31-35). Likewise, as Hadhrat Ahmad (as) noted: “ Whenever a Servant of God appeared at the turn of every century as a Reformer, the ignorant people vehemently opposed him and strongly detested any attempt to correct the errors which had become a part of their habit and custom”. (Lecture Sialkot, p.10) Hadhrat Ahmad (as) further stated: “ See, a Mujaddid comes at the turn of every century. This is also a form of trial from Allah, the Most High . Now also a trial for Muslims is taking place. Allah, the Most High has sent a divinely raised one.” (Malfuzat, vol.10, p.250). Hence, Ahmadis today face a great test of faith: the choice is to accept the Messenger of Allah and be blessed or to reject him and go astray from the way of Allah. The Ahmadiyya Khalifa has the historic opportunity to examine the issue anew and rectify a mistake committed by his predecessor in office by relying on an advice rendered by his Amir. 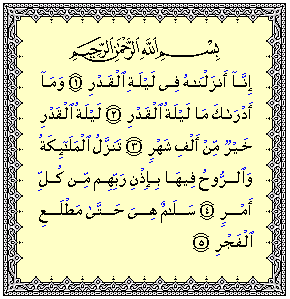 In light of the Divine Plan that Allah has revealed by sending a Messenger of His in our times and in the larger interest of Islamic spirituality, there is a critical need to reexamine the statements of various Khulafa regarding the meaning of Second Manifestation of Divine Power and the coming of Mujaddidin in future. It may be noted that the current Ahmadiyya doctrine on the question of Mujaddidin was fashioned in the 1970’s, during the time of the Third Khalifa Hadhrat Mirza Nazir Ahmad Sahib when the issue was merely theoretical. Given the prophecy of the Holy Prophet (sa) and the writings of Hadhrat Ahmad (as) which authenticated the veracity and validity of the prophecy, there was great excitement in the Jamaat about the possibility of the coming of a new Mujaddid in the near future, though no one had made any such claim at that point of time. 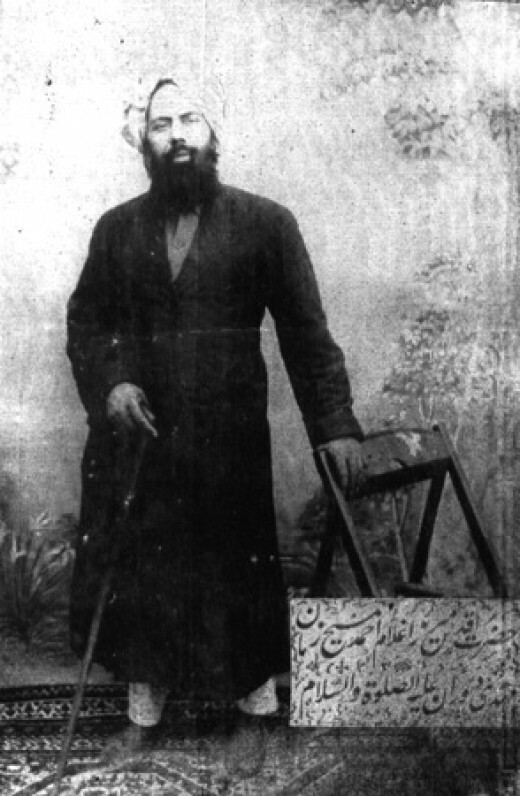 Already, the Jamaat had witnessed the experience of Hadhrat Mirza Basheeruddin Mahmud Ahmad (ra), an elected Khalifa being raised by Allah to be the position of Musleh Maoud, a spiritual status which was bestowed upon him based on the revelations vouchsafed to Hadhrat Ahmad (as) by Allah, the Most High. This is the background of the current doctrine: If ever divine guidance comes, Allah’s choice is restricted to the Khalifas elected by people being elevated with true revelation. It is possible to look at what the Khalifas have told the Jamaat at various occasions in the past as serving the purpose of the Jamaat and its unity at a time when the issue was merely hypothetical and the time of a new Messenger of Allah was still in the womb of future. But now that a new Messenger of Allah has come and believers have started recognizing him, it is only fair to point out that the Ahmadiyya Khalifa needs to utilize the opportunity and reexamine the prevailing doctrine in the light of the present age and adjust it in accordance with the requirements of the new circumstances as well. “And remember the time when Allah took the covenant from the people through the Prophets, saying ‘Whatever I give you of the Book and Wisdom and then there comes to you a Messenger fulfilling that which is with you, you shall believe in him and help him’. And He said, ‘Do you agree, and do you accept the responsibility which I lay upon you in this matter?’ They said, “We agree” He said “Then bear witness, and I am with you among the witnesses”. (3:82). Every Ahmadi Muslim believe that Hadhrat Ahmad (as) is a Messenger of Allah/ Divine Reformer appointed by Allah (swa). So, it is only reasonable to assume that such a divine covenant has been taken from Hadhrat Ahmad (as) as well. In fact, the Promised Massih (as) who wrote over 80 books, made several statements regarding the coming of divinely guided people in his Jamaat in future. For, Hadhrat Ahmad (as) did not come to discard, but to renew the message of the Holy Prophet (sa). In fact, that is what he did through all his teachings and that is why he said that Massihs will come after him. He even specifically declared that there is nothing abnormal or unusual about the spiritual situation if a Mujaddid follows him in the next century. There is a radical disconnect between the profound teachings of Hadhrat Ahmad (as) on the question of future divine guidance and the current official doctrine of the Ahmadiyya Muslim Community. While ordinary Ahmadis continue to believe that the teachings of Hadhrat Ahmad (as) regarding the coming of Mujaddidin and other Messengers of Allah are correct, the Community has already officially disowned the validity of arguments that support the coming of Mujaddidin in future. Most certainly, we cannot blame Hadhrat Ahmad (as) for how his disciples have come to understand and interpret his teachings. This point is glaringly visible in the meaning and interpretation being attributed to the concept of Qudrat-e-Saniya or the Second Manifestation of Divine Power under the mainstream Community’s system of Khilafat. According to Hadhrat Ahmad (as), Allah manifests two kinds of His power in support of the cause of truth and His religion. First, when a Messenger of Allah is around, he receives Divine help and extraordinary support in the promotion of his noble purpose: calling mankind to the path of Allah. Secondly, when the Messenger completes his earthly mission and returns to the Lord, He shows the other manifestation of Divine Power by raising noble souls in order to continue with the unfinished task of the Messenger. 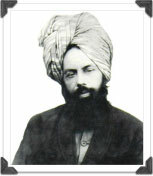 In his testamentary declaration, Al Wassiyat, Hadhrat Ahmad (as) clearly mentioned that the different manifestations of Divine Power in support of the cause of truth have appeared all through spiritual history and he had no doubt about the enduring character of the Islamic Khilafat, which would continue to exist till the Day of Judgement. 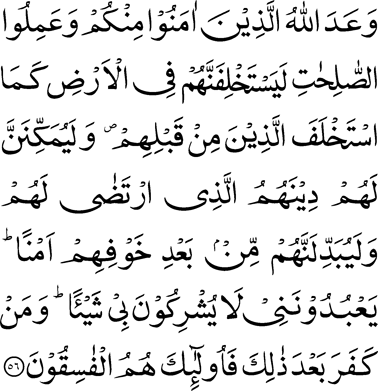 The Holy Qur’an states: “Allah has promised to those among you who believe and do good works that He will, surely, make them Successors in the earth, as He made Successors from among those who were before them; and that He will, surely establish for them their religion which He has chosen for them; and exchange security and peace after their fear; They will worship Me, and they will not associate anything with Me. Then whoso disbelieves after that, they will be the rebellious”.---(Chapter 24; Verse 56). Historically, the institution of Khilafat emerged within the early Muslim community with the election of Hadhrat Abu Baker Siddiq (ra) as Khalifatul Rasul after the death of the Holy Prophet Muhammad (sa). In the history of Islam, there has been three types of Khulafa. Like, mentioned above, the early Khulafa/Caliphs who upheld the faith and its values with sincere and complete devotion after having been taught by the Holy Prophet (sa) himself and they having spent their lives as his companions during the lifetime of the Holy Prophet (sa). These caliphs- Hadhrat Abu Baker Siddiq (ra), Hadhrat Umar (ra), Hadhrat Uthman (ra) and Hadhrat Ali (ra)- are collectively known as the rightly-guided caliphs-Khulafa-ur-Rashidun. The second type of Khulafa are those who came after these pious caliphs. Those who came after the Khulafa-ur-Rashidun were also leaders of the Muslim Ummah, having sovereignty and political authority over the nation. While many of them practiced their religion as they understood their faith, but the Ummah in general do not consider them to be spiritual models, to be emulated like the early exemplars. They were a manifestation of the material glory of the Ummah as a political and religious community as against the other-worldly preoccupations of true saints and believers. The third type of Khulafa are the Divine Reformers or Mujaddidin who appeared in different lands of Islam at different points of time, in the history of Islam. They were the spiritual deputies of the Holy Prophets (sa) who were Divinely-raised, with revelations, inspirations, visions and dreams to guide the Ummah and to be the practical models of a living Islam in their respective communities. As per the Islamic tradition, Allah (swa) will raise a Mujaddid at the turn of every century to preserve the true spirit of Holy Qur'an and the Islamic teachings among the believers and this Divine scheme will continue to serve the spiritual purpose till the Day of Judgement. As these men are Divinely-ordained, they are also known as Khalifatullah or the Vicegerent of Allah. Hence, one of the titles of the Promised Massih (as) is as Khalifatullah.